The coconut palm (Cocos nucifera L.) stem tissue (referred to as cocowood in this study) is a complex fibrovascular system that is made up of fibrovascular bundles embedded into a parenchymatous ground tissue. The complex configuration of fibrovascular bundles along with the non-uniform distribution of the material properties likely allow senile coconut stems to optimize their biomechanical performance per unit mass (i.e., mechanical efficiency) and grow into tall, slender, and very flexible plants with minimum resources of biomass and water. For the first time, to the best of the authors' knowledge, this paper examines, from the integral (i.e., stem structure) and macroscopic (i.e., tissue structure) levels of hierarchy, the characteristic triple helix formation depicted by the fibrovascular bundles within the monocotyledon cocowood. 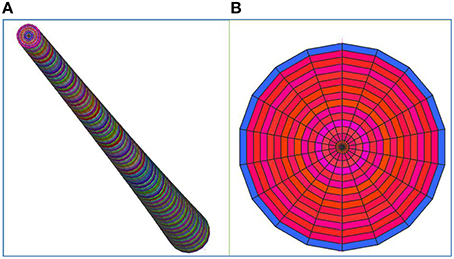 The natural course of the tangential orientation of the axial fibrovascular bundles is mapped for the whole cocowood structure by quantifying 264 cocowood discs, corresponding to 41 senile coconut palms estimated to be >70 years old. The observed variations were modeled in this paper by simple equations that partially enabled characterization of the cocowood fibrovascular tissue system. Furthermore, 11 finite element analyses (FEA) were performed over a three dimensional (3D) finite element (FE) model resembling a characteristic coconut palm stem of 25 m in height to analyze the biomaterial reactions produced by the progressive deviation of the tangential fibrovascular bundles on the cocowood mechanical response (i.e., on the material compressive strength and the bending stiffness). 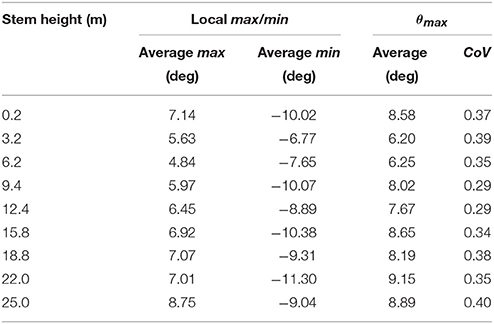 The analyses in this study were carried out for the critical wind speed of 23 m/s (i.e., Gale tornado according to the Fujita tornado scale). For each analysis, the characteristic average maxima degree of orientation of the cocowood fibrovascular bundles was varied from 0° to 51°. The acquired results provided a deep understanding of the cocowood optimum fibrovascular tissue system that denotes the natural evolution of the material through millions of years. The knowledge advanced from this study may also serve as concept generators for innovative biomimetic applications to improve current engineered wood products. According to botanical taxonomy, coconut palms (Cocos nucifera L.) belong to the palm tree family (Arecaceae), a family of monocotyledon plants whereas hardwoods and softwoods are woody plants with similar stem characteristics from the point of view of structural mechanics, but different tissue properties (e.g., quasi-uniform vs. non-uniform density distribution; Bahtiar et al., 2010). The main differences between palmwoods, hardwoods, and softwoods are summarized by Butterfield et al. (1997). The coconut palm stem is composed of two anatomical components: the cortex and the central cylinder. The cortex is a fibrous tissue covering the entire outer circumference of the stem. It is typically 1–1.5 cm thick and plays a similar function to that of the bark in woody plants (Tomlinson, 1990). The central cylinder is a plant tissue (referred to as cocowood herein) that constitutes more than 96% of the palm stem. Cocowood is a complex tissue that depicts a cellular structure (Gibson, 2005) comprising two different tissues as shown in Figure 1. Figure 1. Cocowood is a complex vascular tissue system that depicts a cellular structure that can be described as parallel stiff fibers embedded in foam. Its simple botanical description is a blend of two structurally and functionally divergent cell tissues: (a) the fibrovascular bundles with a honeycomb-like structure, which are rounded and dense groups of long fibers surrounding vessel elements for sap circulation, mainly orientated in the longitudinal axis of the stem, and (b) the ground tissue made up of foam-like polyhedral parenchyma cells. The fibrovascular tissue system (i.e., the assemblage of conducting tissues and associated supportive fibers) of monocotyledonous palms has been extensively investigated from different levels of hierarchy (Zimmermann and Tomlinson, 1972; Tomlinson et al., 1984, 2001, 2011; Tomlinson, 1990, 2006; Rüggeberg et al., 2008, 2009; Thomas and De Franceschi, 2013). The system is essentially made up of three elements: axial fibrovascular bundles, leaf traces, and fibrous cortical traces (Zimmermann and Tomlinson, 1972). The axial fibrovascular bundles remain within the stem tissue and provide longitudinal continuity to the palm structure (Tomlinson, 1990). Both leaf and cortical traces connect the stem fibrovascular system with that of the leaves and petioles (Rüggeberg et al., 2009). Moreover, the leaf traces are connected to the axial fibrovascular bundles within the stem central cylinder by narrow bundles called bridges (Tomlinson, 1990). The fibrovascular bundles are made of fibers, xylem, phloem, and axial parenchyma. The fibers constitute over half of the volume of each fibrovascular bundle (Butterfield et al., 1997). In monocotyledonous palms, the fibers have thin walls and large lumens (cavities inside the fibers) toward the stem core, and thick walls and small highly lignified lumens toward the stem periphery (Fathi et al., 2014). This implies denser and stronger fibers at the stem periphery likely influencing the biomechanical performance of palm stems, in terms of bending strength (Sudo, 1980; Rich, 1986, 1987; Butterfield et al., 1997; Fathi and Frühwald, 2014) and bending stiffness (Rüggeberg et al., 2009). The fiber walls are commonly multi-layered (e.g., similar to cell wall layers of hardwood fibers) and the thickness and microfibril orientation of each layer are clearly visible under light microscopy (Butterfield et al., 1997). Thousands of fibrovascular bundles (e.g., 20,000 approximately) are scattered within a single transverse section of a senile (i.e., <60 years old) coconut palm stem (Zimmermann and Tomlinson, 1972; Tomlinson, 1990). Radial density and fibrovascular bundle distribution develop non-homogeneously throughout the palm stem, with denser tissue toward the periphery and base, where the biomechanical performance of the material shows maximum bending stresses (Rüggeberg et al., 2009; Gibson, 2012). According to Killmann and Fink (1996), the distribution of fibrovascular bundles within coconut stems can be classified into three different zones: (a) the dermal zone, close to the cortex, with a high density distribution of about 68 fibrovascular bundles per cm2, (b) the sub-dermal zone, with a medium density distribution of about 42 fibrovascular bundles per cm2, and (c) the central zone, with a low density distribution of about 18 fibrovascular bundles per cm2. The average cross-cut area of the single fibrovascular bundle within cocowood stems was found to vary from 0.30 mm2 at the central zone to 0.53 mm2 at the dermal zone (Fathi et al., 2014). The high and low distributions of fibrovascular bundles toward the palm stem periphery (dermal zone) and core (central zone), respectively, reflect an efficient structure that is not excessively overbuilt (Tomlinson, 1990). Rüggeberg et al. (2009) by studying the structure–function relationships of different vascular bundle types in one 33 year-old Washingtonia robusta palm at an elevation of 5 m graphically reported the radial degree of orientation of the fibrovascular bundles. The bundles were found to move toward the periphery of the stem, with the higher degree of orientation reported in the dermal zone of the stem. From the literature review, it appears that, only one study performed by Kuo-Huang et al. (2004) has reported a partial degree of orientation of axial fibrovascular bundles within juvenile coconut stems (20–25 years old), average heights of 6 m. Kuo-Huang et al. (2004) graphically showed a tangential degree of orientation of fibrovascular bundles across the stem diameter that varied from 4° to 12° at the bottom of the studied stems. Although the development of the fibrovascular system of monocotyledonous tissues has been investigated at different hierarchical levels, and the triple helix formation of cocowood fibrovascular bundles (Figure 2) has been observed, they have not yet been characterized and modeled for the whole cocowood structure. Furthermore, the extent to which the degrees of orientation of the fibrovascular bundles influence on the cocowood stem biological function has remained unknown up to now. These observations were the driving forces behind the work in this study. Figure 2. Cocowood triple helix pattern shown in a radially split disc. Similar to the zigzag pattern described by Rüggeberg et al. (2008) for Washingtonia robusta palms, the cocowood fibrovascular bundle architecture follows an axisymmetric and triple helix configurations across the palm stem diameter. where x is the distance between the lines UL and SL, and hb is the measured disc height of break, as shown in Figure 3B. Figure 3. (A) Each disc was split up to a depth of 10 mm with a 1100 mm long lathe-blade and manually torn apart. This left a straight split line (SL) on the upper face of the disc, where the blade was driven, and an undulated split line (UL) on the lower face that followed the fibrovascular bundles. (B) Measurement of the tangential fibrovascular bundle degree of orientation. Table 1. Measured maximum radiuses at the studied key stem elevations. where θmin, i and θmax, i are the values of the ith local minimum and maximum, respectively. The natural frequency f of the triple helix was calculated from the frequency spectrum of the discrete FT applied to the tangential fibrovascular bundle degree of orientation measurements of each disc. With the discretization of 100 measurements, two different types of frequency spectra occurred: (i) two distinct dominant frequencies with no clear peak were observed, as shown in Figure 5A, and (ii) only one dominant frequency was observed, as shown in Figure 5B. When no clear peak was observed, the two dominant frequencies were considered to both contribute to the signal if their magnitudes do not differ by more than 25%. In this case, the triple helix frequency f was approximated as the average of these two dominant frequencies. Otherwise, the frequency with the higher magnitude was considered to predominantly contribute to the signal and the helix frequency f was taken as this frequency. Figure 4. Measured, attenuated (after applying FT), and proposed tangential fibrovascular bundle degree of orientation for palm 13 (Fiji) at 12.4 m high. 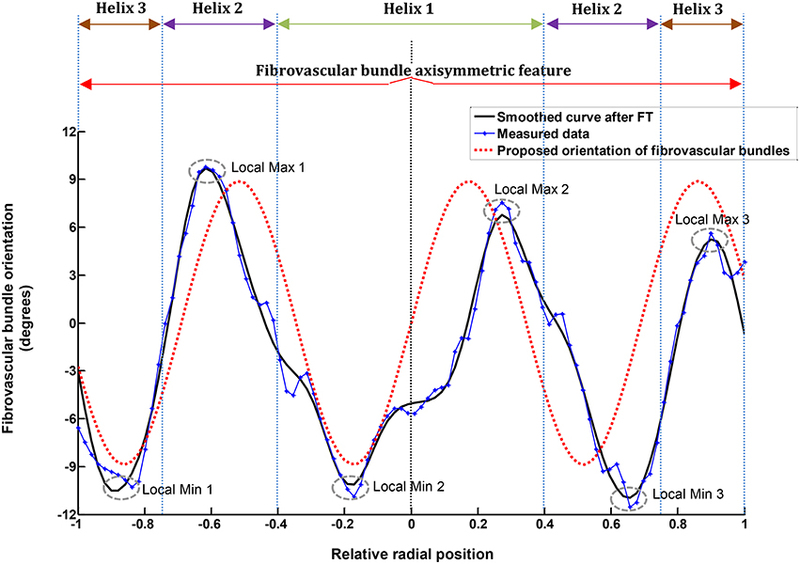 The characteristic cocowood fibrovascular bundle degree of orientation proposed herein (i.e., the red segmented curve) provides similar results to the actual measurements for the given palm; it also shows the axisymmetric and triple helix configurations of the fibrovascular bundles. Figure 5. Frequency spectrum with (A) no clear peak [palm 15 (Fiji) at 0.2 m high], and (B) one dominant frequency [palm 21 (Fiji) at 0.2 m high]. The 3D FE model of a characteristic senile coconut palm stem shown in Figure 6 was built using the commercial finite element software Strand7 (2005). From the structural mechanics point of view, palm stems can be considered as composite, hierarchically structured, and fiber-reinforced beams (Speck and Burgert, 2011). Therefore, the cocowood FE model herein bears a resemblance to a fully fixed (i.e., all the model bottom surface nodes were constrained to the ground) cantilever tapered beam or pole with foliage but no branches. The structural modeled system has consequently one degree of freedom. In the FE model, the characteristic form, complex structure of the coconut stem-tissue and the cocowood properties were all derived from previous findings by the author (Gonzalez et al., 2014, 2015; Gonzalez, 2015). 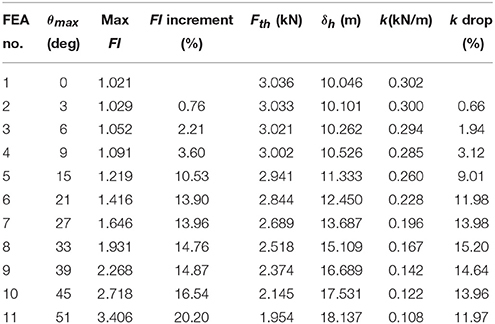 Table 2 gives characteristic green properties [i.e., basic density (db), modulus of elasticity (MOE), compressive modulus of rupture (MOR), shear modulus (G), and shear strength (τmax)] at key locations of the cocowood FE model, in the longitudinal (L), radial (R), and tangential (T) directions. Figure 6. A 64,800 brick element FE model, with a maximum aspect ratio of about 10, was selected as optimum for carrying out the finite element analyses. The cocowood optimum FE model included 240, 18, and 15 divisions, axially, peripherally, and radially, respectively. The whole domain in the FE model was meshed with 65,311 nodes. (A) Axial perspective of the characteristic coconut stem model, (B) Cross-sectional area at the bottom of the model. Note that the color coding in the figure is reflecting brick elements with different properties. Table 2. Green material properties for a characteristic senile coconut palm stem. The orthotropic material behavior and the radial triple helix configuration depicted by the tangential deviation of the axial fibrovascular bundles were captured in the cocowood FE model by using the 3D brick orthotropic element property from Strand7 (i.e., 8-node brick elements have different properties for the L, R, and T directions, depending on their location within the FE model). The number of brick elements along the radius, height, and perimeter of the cocowood FE model, was tested until reaching the most appropriate mesh for the analyses. Thus, a regular solid mesh was generated to uniformly distribute the nodes in the FE model that allowed a uniform application of the wind pressure profile. Besides, the stresses developed within the cocowood model by the applied loading conditions described below, were calculated by Strand7 at the centroid of each brick element (i.e., the resultant brick stress value reflected the average of the corresponding eight brick Gauss points). Specifically, eight finite element models were analyzed at the acute wind speed of 60 m/s (i.e., Significant tornado according to the Fujita tornado scale; Cullen, 2002) to define the most appropriate FE model for the current analyses. Table 3 gives detailed information about each analyzed model. Two aspects were considered when defining the optimum model in this study: (i) an aspect ratio no >10 for each brick element, and (ii) a time no >1 h 15 min to process the model. Additionally, three parameters were considered to find the point of convergence when the total number of brick elements was varied in the model: (i) the maximum stress occurring in the axial direction of the model; (ii) the vertical displacement at the top/middle node of the FE model, and (iii) the displacement at the top/middle node of the model in the wind direction. Table 3. Results of the mesh and convergence studies. A Python program code was used to integrate the typical coconut stem form, complex structure, material properties, and loads acting on the model. The program code automatically reproduced the palm stem model, which in turn was exported to Strand7 to perform the analyses, and the relevant results were retrieved again by the Python program for easy of data evaluation and presentation. The code also considered the progressive reduction of the stem projected area due to higher deflections experienced as the wind speed increased up to 23 m/s. No damping or swaging effects (i.e., dynamic analyses) during extended high wind events were considered herein as a pilot study showed a relative low-frequency response of about 0.2 Hz for the first natural frequency bending mode of vibration; the modal analysis was done around the equilibrium position (i.e., the non-deformed stem position) from the static geometry calculated around the unloaded state. The vortex-shedding effect was also disregarded due to two main reasons: (i) the high bending capacity (i.e., nearly to quarter circle for wind speeds >23 m/s) and the marked streamlining effect [i.e., foliage moves into alignment with the wind direction (flag) as the wind force increases] allowed reducing the palm crown/stem projected areas and the pressure drag. Hence, the whole structure reduced the wind surface, the bending moments and the vortex shedding phenomenon. (ii) The vortex shedding frequency was found to be very low (i.e., about 0.077 Hz) for an average slender coconut stem diameter of 237.8 mm, and the critical wind speed under investigation (i.e., 23 m/s), and thereby the quasi-static state portion of the movement dominated the analyses. Thus, non-linear static analyses (NLA) were performed taking into account the cocowood stem's geometric non-linear effect (GNL) produced by the large deflections in the model. where ρair is the density of air equal to 1.225 kg/m3 (i.e., at sea level and 15°C), fh is a coefficient that varies from 0.99 to 1.22 depending on the stem height (i.e., from 0 to 25 m) at which Pw is applied, and Ws is the wind speed in m/s. where Pw in N/m2 was considered at the palm stem top (25 m in this analysis), Aproj (in m2) is the projected area by the coconut leaves at the palm stem's crown, and CD is the drag coefficient assumed to be constant and equal to 1. The coconut palm projected area Aproj, equal to 1.2 m2 in this study, was derived from related studies (Rich et al., 1995; Rudnicki et al., 2004; Vollsinger et al., 2005). The vertical self-weight load (P) was calculated in terms of gravity and mass of the cocowood structure. To fulfil the purposes in this study, a total of 11 finite element analyses (FEA) were carried out over the 3D cocowood FE model exposed to the wind speed of 23 m/s (i.e., Gale tornado, according to the Fujita tornado scale; Cullen, 2002); the wind speed that was determined in Gonzalez (2015) as the critical wind speed (i.e., the wind at which the material tissue starts reaching stress at failure) under the equivalent bending moment of 64.4 kN.m. The analyses were performed by varying the characteristic cocowood average maxima fibrovascular bundle degree of orientation θmax from 0° to 51°. It thus changed the characteristic cocowood fibrovascular tissue system in terms of θ, given by Equation (2). Higher θmax variations were not examined as the results from the above-mentioned range showed well-defined trends for both the material stress at failure and the palm bending stiffness. Furthermore, the optimal average maxima fibrovascular bundle degree of orientation was determined by the point at which the cocowood tissue endured high load without considerably reducing its compressive strength and bending stiffness. where Fth (in kN) is the horizontal reaction force acquired from the FEA in Strand7, and δh (in m) is the maximum horizontal displacement in the wind direction at the top/middle point of the cocowood model. where σL, σR, and σT (in MPa) are stresses in the L, R, and T directions, respectively. MORL, MORR, and MORT (in MPa) are the compressive strengths in the L, R, and T directions, respectively. τLR, τRT, and τTL (in MPa) are shear stresses in the longitudinal-radial (LR), radial-tangential (RT), and tangential-longitudinal (TL) planes, respectively. τmaxLR, τmaxRT, and τmaxTL (in MPa) are the material shear strengths in the LR, RT, and TL planes, respectively. 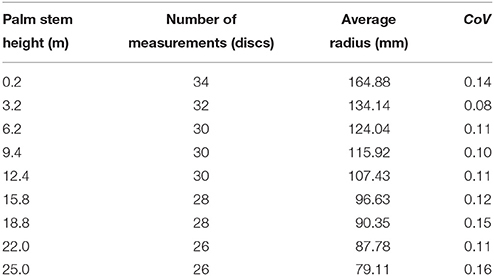 The results for this part of the study are based on 26,400 fibrovascular bundle degree of orientation measurements corresponding to 264 cocowood discs. Preliminary analysis showed no significant differences in the acquired global measurements between the different coconut growing sites (i.e., Fiji and Samoa). Thus, the results in this section represent the analysis of the coconut palms sourced from Fiji and Samoa islands altogether. Table 4. Average maxima tangential fibrovascular bundle degree of orientation (θmax) for the studied coconut palms. Figure 7. The average maxima fibrovascular bundle degree of orientation θmax against the palm stem height is plotted in the figure. Two specific patterns can be observed. First, the average maxima fibrovascular bundle degree of orientation decreases with the stem height from 0 to 3.2 m and second, quasi-linearly increases with the stem height above 3.2 m. Thus, the highest deviation of fibrovascular bundles occurs toward the upper part of the palm stem where the higher flexibility of the material is needed during extreme loading conditions. 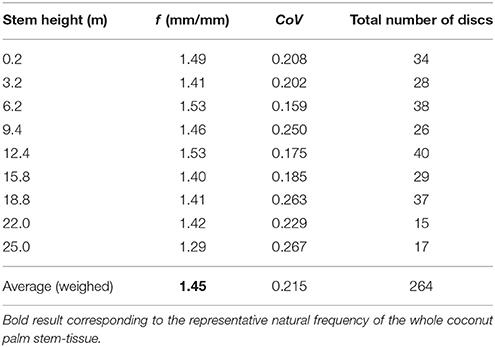 Table 5 gives the average values of natural frequencies found at the investigated stem heights. No clear correlation between the natural frequency of the tangential fibrovascular bundle degree of orientation and the palm stem height can be found and, therefore, a unique natural frequency f of 1.45 mm/mm is considered herein for the entire palm. Thus, the proposed tangential fibrovascular bundle degree of orientation presented in Figure 4 was calculated by using Equation (2) with inputs from Equation (3), Equation (9), and the above mentioned natural frequency f. Similarly, Figure 8 maps the proposed tangential fibrovascular bundle degree of orientation for the whole structure of a characteristic coconut stem of 25 m in height. Table 5. Average values of natural frequencies at all investigated heights and the representative natural frequency f for all the studied cocowood discs. Figure 8. The proposed typical triple helix distribution of tangential fibrovascular bundle degrees of orientation is shown on the plane of symmetry of a characteristic senile coconut palm 25 m stem height. The cocowood structure in the figure shows an apparent pattern of fibrovascular bundles with a maximum deviation of 9.15°. Note also a different fibrovascular bundle configuration up to a stem height of 3.2 m.
Table 6 gives the results from the FEA for every variation of the average maxima fibrovascular bundle degrees of orientation (0°–51°) when the wind speed of 23 m/s is acting on the whole cocowood structure. Figure 9 shows both the palm stiffness k and the maximum failure stress FI, plotted against the variation of average maxima fibrovascular bundle degrees of orientation (0°–51°) for the analyzed wind speed. 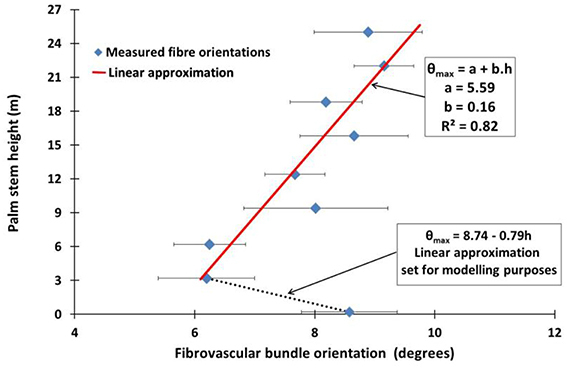 In the main, the research findings show a significant increase in material failure index and a severe decrease of the palm bending stiffness for fibrovascular bundle degrees of orientation >9°. It can also be noticed that both factors (i.e., FI and k) are critically reduced when the average maxima fibrovascular bundle degrees of orientation become ≥33°. Table 6. FEA results for the variation of θmax at the critical wind speed of 23 m/s. Figure 9. An insignificant increase in material failure index FI (segmented line with blue circles) is observed for fibrovascular bundle degrees of orientation up to 9°. Beyond this point, the slope of the FI curve starts to drastically increase reaching a FI of about 3.5 when the angle varied to 51°. For the θmax of 15°, there is a sudden FI increment that is three times higher than the previous value at 9°. 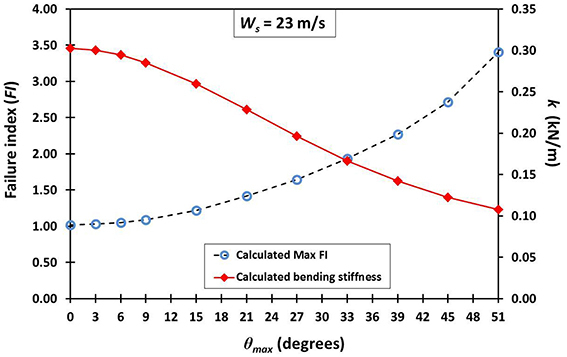 Similarly, the palm bending stiffness k (red line with rhombi) is sharply reduced by nearly three times from 9° to 15°. The identified trends become higher and lower, respectively, for the greater values of θmax. Similar to some monocotyledonous palms (e.g., W. robusta palms), senile coconut palms are tall and slender with an aspect ratio (about 80) that tends to indicate excellent stability (Slodicak and Novak, 2006) with a high bending capacity during strong wind conditions (Fratzl and Weinkamer, 2007). Indeed, from the acquired results it has been revealed a cocowood structure that is, from the structural mechanics point of view, stronger toward the palm stem's bottom-periphery, where the greater concentration of fibrovascular bundles were found. Interestingly, the cocowood structure at the stem's top part close to the leaves has the minimum diameter and is the least dense part of the stem with the highest deviation of fibrovascular bundles, which structurally means it is the most flexible part of the whole structure. This strategy may likely permit the palm stem to better bend or efface itself under high wind conditions with the leaves streamline effect offering a very low resistance to wind pressure. Yet, it is a hypothesis that might be proved by future studies. The calculated average maxima fibrovascular bundle degree of orientation at the bottom part of the stem (see Figure 7) markedly differs from those for the higher elevations. It clearly reflects a different configuration of the cocowood fibrovascular tissue system at this section of the palm stem. This occurs due to the transition between the stem-tissue and root systems, both having structurally and functionally different configurations (Niklas, 1992). For modeling purposes, these properties have been represented in this study by simple linear equations that match the dissimilar property regions. However, the atypical pattern found close to the bottom of the palm stem needs further investigation, likely from a different approach (e.g., microscopic), in order to accurately depict the structure at this region of the coconut stem. Note that the average maxima fibrovascular bundle degree of orientation θmax of 8.58° was found in this study at the bottom of the characteristic senile coconut palm stem whereas the θmax of 12° was reported by Kuo-Huang et al. (2004) for juvenile palms (6 m high) at the same stem location. It can be inferred that tangential fibrovascular bundles likely become less deviated in senile cocowood due to the structural adaptation process experienced as coconut palm stems grow taller and have to resist higher external loading conditions; a common phenomenon in plant species (Zhang et al., 2012). The cocowood mechanical response observed when varying the degrees of orientation of fibrovascular bundles has in principle (i.e., the greater the fiber orientation, the inferior the tree stem mechanical response, and vice versa) some similarity to that of hardwoods and softwoods. For example, the woody stem spiral configuration of the southern Utah's Ponderosa pine (Pinus ponderosa) species was studied by Leelavanichkul and Cherkaev (2004) to determine the influence of fiber orientations (varying from 21.2° to 90°) on the trunk strength under three progressive wind forces expressed in terms of bending moments (2.26, 22.59, and 90.39 kN·m). The results showed that the Ponderosa pine trunk failed when the critical fiber angle was set at 37°. The critical average maxima fibrovascular bundle degree of orientation of 33° was found herein. The reason of such similar findings may have its foundations on (i) the similar fibrovascular-cellular structure (i.e., an assembly of prismatic or polyhedral cells with solid edges and faces packed together to fill space; Gibson, 2005) that both cellular solids (i.e., woody plants and palmwoods) have in common, and (ii) the related mechanical characteristics that are mutual for tree stems in order to support static and dynamic loads, store and release elastic energy, bend through large angles, and resist buckling and fracture. When the fibrovascular bundle degrees of orientation varied between 0° and 9°, a superior cocowood biomechanical response was identified in terms of the stem bending stiffness and the material capacity to undergo failure due to generated stresses and strengths. Average maxima fibrovascular bundle degrees of orientation beyond this limit (θmax of 9°) significantly reduced the palm bending stiffness and weakened its compressive strength with a consequent increase in material failure (FI). Thus, a θmax = 9° is identified as the maximal fibrovascular bundle degree of orientation, defined in Leelavanichkul and Cherkaev (2004) as the maximum fiber angle that does not substantially reduce/weaken the stiffness and strength of a tree. It can thus be concluded that senile cocowood fibrovascular tissue systems are optimally arranged complex structures, partially because of the typical variation of average maxima fibrovascular bundle degrees of orientation (i.e., 6.2° to 9.1°) that was found herein to be within the limits of the maximal fibrovascular bundle degree of orientation defined above. Where nature has already optimized the structure of a living organism, it is assumed there must be a reason for it. In fact, what has been observed in the current analysis is not just a random causality of the biomechanical behavior produced by the cocowood fibrovascular tissue system; on the contrary, it is without doubt, a phenomenon that reflects an optimized cocowood fibrovascular development resulting from the natural adaptation of the material to resist varying conditions of external forces [e.g., gravity (biomass), wind, and rain water], during the course of millions of years of evolution. Wind forces, for example, become critical as trees age and grow taller, particularly because, during high wind episodes, the forces induced on the stems, foliage, and roots can reach critical bounds. If surpassed, these forces will result in failure. Further, while strong winds may occur only a few times in a tree's life, its resistance capability to overturning or breaking during these extreme weather conditions is critical to its survival (Vogel, 1989, 1996). 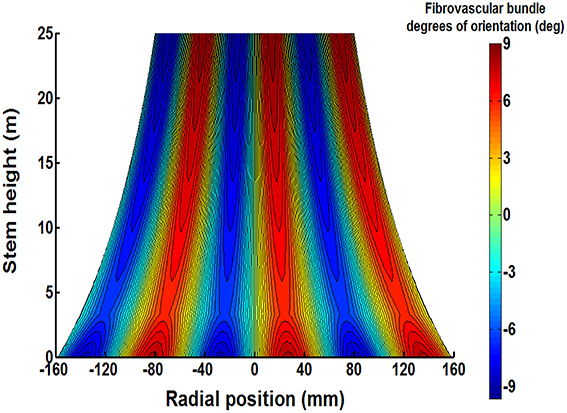 The acquired results in this study evidenced an efficient cocowood fibrovascular tissue system that highlighted its optimal local design in terms of the tangential deviation of the axial fibrovascular bundles. The present analyses significantly advanced the understanding of the cocowood fibrovascular tissue system and, concomitantly, of the monocotyledonous palms. The research findings have a significant future potential for innovative material/structure concepts; e.g., the representative cocowood fibrovascular bundle degrees of orientation proposed herein may serve as a biomimetic inspiration to produce superior engineered wood products (EWPs) such as coconut fiber reinforced polyethylene composites (Brahmakumar et al., 2005) and/or spirally wood-laminated composite poles (Piao et al., 2008; Berard et al., 2011). Yet, further research from a multidisciplinary approach should be carried out to reveal other properties and underlying principles of the biomaterial at the macroscopic, microscopic, ultrastructural, and biochemical levels of hierarchical structure. Such studies would also improve our understanding of the cocowood fibrovascular development; a system that has evolved in accordance with engineering principles long before these principles were known. Dr. OG performed the measurements and analyses, derived the equations, drew the figures, and wrote the paper. Dr. KN supervised the work, reviewed the analyses, and wrote the paper. The authors gratefully acknowledge the constructive comments on this paper offered by Professor Luis Cumbal, Professor Jorge Zuñiga (Universidad de las Fuerzas Armadas ESPE—Ecuador) and Dr. Hongyu Qin (Griffith University—Australia). The authors would like to also thank the Department of Agriculture and Fisheries (DAF), Queensland Government, for supplying the material and data collected during the ACIAR project, FST/2004/054 and Universidad de las Fuerzas Armadas ESPE in Ecuador for funding us to publish this paper. AS/NZS 1170.2 (2011). Structural Design Actions, Part 2: Wind Actions. Australian/New Zealand Standard. AS/NZS 4676 (2000). Structural Design Requirements for Utility Services Poles. Australian/New Zealand Standard. Butterfield, B. G., Meylan, B. A., and Peszlen, I. M. (1997). Three Dimensional Structure of Wood. London: Chapman and Hall Ltd.
Cabrero, J., and Gebremedhin, K. (2010). “Evaluation of failure criteria in wood members,” in Electronic Proceedings of the World Conference on Timber Engineering (WCTE2010) (Trentino). Cullen, S. (2002). Trees and wind: wind scales and speeds. J. Arboricul. 28, 237–242. De Mirbel, C. (1843). Recherches anatomiques et physiologiques sur quelques vegetaux monocotyles. C. R. Paris 19, 689–695. Gonzalez, O. M. (2015). An Engineering Approach to Understand Senile Coconut Palms as Foundation for Biomimetic Applications. Ph.D. thesis, Griffith School of Engineering, Griffith University, Gold Coast Campus, Australia. Gonzalez, O. M., Gilbert, B. P., Bailleres, H., and Guan, H. (2014). “Compressive strength and stiffness of senile coconut palms stem green tissue,” in Proceedings of the 23rd Australasian Conference on the Mechanics of Structures and Materials (ACMSM23), Southern Cross University, Byron Bay (Byron Bay, NSW), 881–886. Gonzalez, O. M., Gilbert, B. P., Bailleres, H., and Guan, H. (2015). “Shear mechanical properties of senile coconut palms at stem green tissue,” in Proceedings of the 4th International Conference on Natural Sciences and Engineering (2015ICNSE), Higher Education Forum, Kyoto Research Park, Japan (Kyoto), 529–543. Hull, D., and Clyne, T. (1996). An Introduction to Composite Materials. New York, NY: Cambridge University Press. Jones, R. M. (1999). Mechanics of Composite Materials. Philadelphia, PA: Taylor & Francis, Inc.
Killmann, W., and Fink, D. (1996). Coconut Palm Stem Processing. A Technical Handbook. Eschborn: Protrade, GTZ. Meneghini, G. (1836). Ricerche Sulla Struttura del Caule Nelle Piante Monocotiledoni. Padua: Minerva. Piao, C., Shupe, T. F., Tang, R., and Hse, C. Y. (2008). Finite element modeling of small-scale tapered wood-laminated composite poles with biomimicry features. Wood Fiber Sci. 40, 3–13. Rich, P. M. (1986). Mechanical architecture of arborescent rain forest palms. Principes 30, 117–131. Strand7 (2005). Theoretical Manual: Theoretical Background to the Strand7 Finite Element Analysis System. Sydney, NSW: Strand7 Pty Limited. Tomlinson, P. B. (1990). The Structural Biology of Palms. New York, NY: Oxford University Press. Tomlinson, P. B., Horn, J. W., and Fisher, J. B. (2011). The Anatomy of Palms: Arecaceae-Palmae. Oxford, UK: Oxford University Press. Tomlinson, P., Forest, H., and Petersham, M. (1984). Contemporary Problems in Plant Anatomy - Development of the Stem Conducting Tissues in Monocotyledons. New York, NY: Academic Press. Ugural, A. C. (2008). Mechanics of Materials. Newark, NJ; Hoboken, NJ: New Jersey Institute of Technology; John Wiley & Sons Inc.
Vogel, S. (1996). Blowing in the wind: storm-resisting features of the design of trees. J. Arboricult. 22, 92–98. Winter David, P. A. (1997). Signal Processing and Linear Systems for the Movement Sciences. Waterloo, ON: University of Waterloo. Copyright © 2016 González and Nguyen. This is an open-access article distributed under the terms of the Creative Commons Attribution License (CC BY). The use, distribution or reproduction in other forums is permitted, provided the original author(s) or licensor are credited and that the original publication in this journal is cited, in accordance with accepted academic practice. No use, distribution or reproduction is permitted which does not comply with these terms.